One of the new sweets I tried this festive season. The natural sweetness of dates and crunchy nuts make this treat a healthy one. 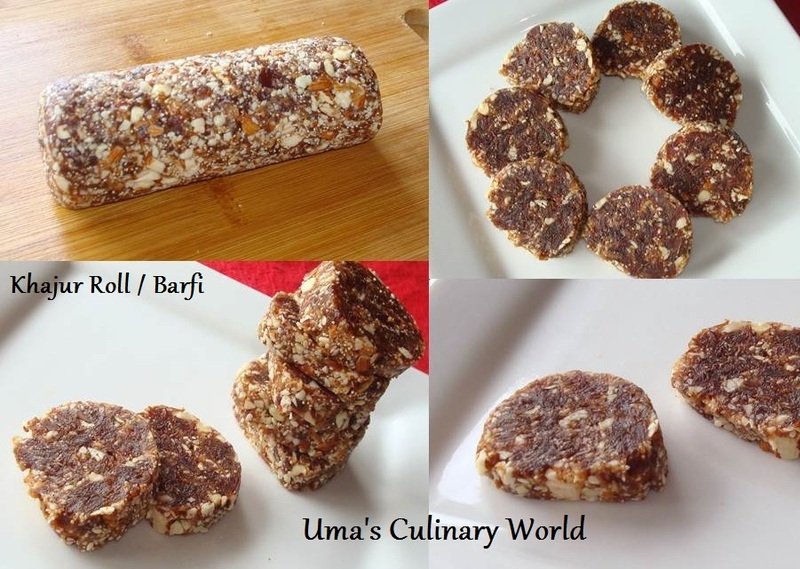 And this Homemade Nutrition Bar cooked in a microwave does not require any sugar or sweetener. A guilt free, sugar free Barfi for this Diwali. Wipe a microwave safe bowl dry. Add almonds or walnuts or any other nuts of your choice to the bowl. Microwave for 1 minute. I used raw almonds with skin. Almond skin is rich in nutrients, but discard them if you don't like. Keep the roasted almonds aside. Check for seeds in the dates. Add dates to the bowl and microwave dates for a minute. You will notice that dates soften a little after heating. Microwave for one more minute. Add the dates to a dry blender/food processor jar and blend it to small pieces or a coarse paste. Do not add water. Now add roasted almonds to the food processor jar and grind it to big pieces. You can grind them to a fine powder too. Using a knife, you can roughly chop them as well. In the same bowl, add 1 tbsp butter. Microwave for 30 seconds or until butter melts. Add poppy seeds and sesame seeds. Microwave for one minute. This will roast the seeds a little and won't have a raw taste. Now add dates and nuts to the bowl and mix all the ingredients well. Dates will help in binding the nuts. Shape it like a roll and cover it with plastic food wrap and refrigerate for about an hour. Refrigeration is not absolutely necessary, but it will help in getting that nice round shape of the barfi. Cut the roll into round slices. You can shape them into round ladoos as well. Or, roll it out as thin or thick you desire, using a rolling pin and cut out desired shapes using a cookie cutter. Along with dates, you can add other dry fruits like raisins/dry grapes, apricots, figs, prunes, dry mangoes for a colorful Mixed Dry Fruits Roll. If you like more sweetness for this Khajur Barfi, roll them in powdered sugar. Alternatively, this Barfi can be cooked at low flame in a pan, on a stove top as well. Enjoy homemade, nutritious Dates and Nuts Bar anytime you like. Healthy burfi,love this quick version.